After reanalyzing simulations of NuG2—a designed mutant of protein G—generated by Lindorff-Larsen et al. with time structure-based independent components analysis and Markov state models as well as performing 1.5 ms of additional sampling on Folding@home, we found an intermediate with a register-shift in one of the β-sheets that was visited along a minor folding pathway. 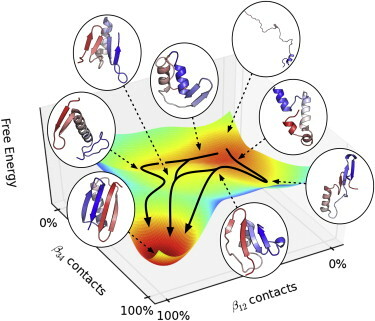 The minor folding pathway was initiated by the register-shifted sheet, which is composed of solely nonnative contacts, suggesting that for some peptides, nonnative contacts can lead to productive folding events. To confirm this experimentally, we suggest a mutational strategy for stabilizing the register shift, as well as an infrared experiment that could observe the nonnative folding nucleus.